Abi Scheid looks to make a pass. Tasha Pointer coached Scheid before she was hired by the Flames. It wasn’t until after former Northwestern associate head coach Tasha Pointer took the head coaching job at Illinois-Chicago that she realized she’d have to play against her former school. 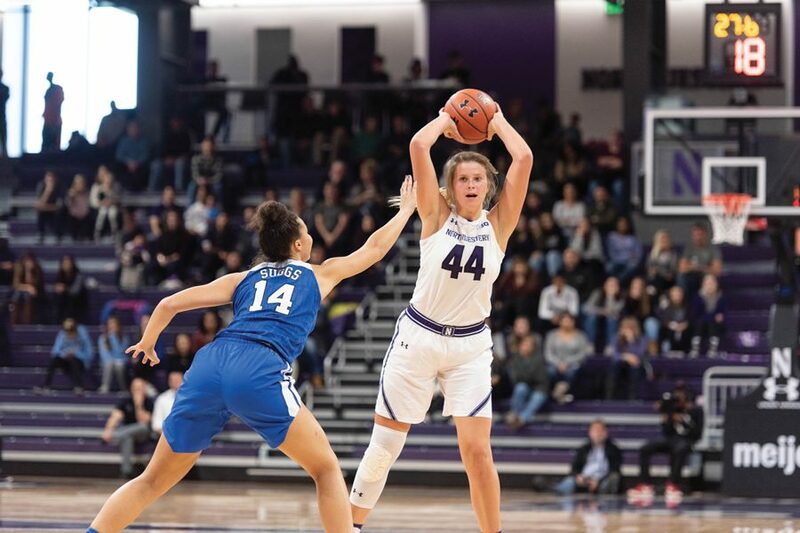 Thursday, the Flames lost 87-44 in her return to Evanston as the Wildcats moved to 3-0 on the season. Pointer, who coached the team in the 2017-18 season, spoke at length after the game about the experience and how this Wildcat team is different from last year’s. It was different because Northwestern came out and punched us first. We didn’t know how to respond, and so we went back to our old ways… and we didn’t fight back. I keep saying this, I think they’re a Sweet 16 team. With the right bounce, they could be an Elite Eight or Final Four (team). With “Pull-up Pulliam” playing her best basketball right now along with Jordan, I mean those two, they got a lot of experience last year. You can definitely tell. One of the things that I learned from him was no matter what, run your stuff, have great expectations of your team and have your team execute. I think what you saw tonight, some teams after a big win like Duke, they can have a letdown game. There was no letting down. I’m just happy Pallas didn’t dunk the ball. So all is well. Frustrated we lost, but Pallas didn’t dunk because the last time I saw Pallas, she told me she was going to dunk in this game. If I know Pallas, she was going for the dunk. They came in and they were talented individuals. I think the role as an assistant coach helping the head coach is to just continue to instill confidence in each player and what they do extremely well. We call Pulliam “Pull-up Pulliam” because that pull-up game is serious. I would probably say she pulls up like a guy. No seriously, it’s one-two dribble and she’s right in her shot. And so she had that before I even touched her as an assistant coach. But I think the thing we discussed at the end of the year was expanding her jump shot. She takes threes comfortably. And the other facet is the other night against Duke she had like four assists. Her total game is beginning to shine because she can do more than just pull-up. Coming into the game I was just conflicted. You want to beat your former team, like who wants to lose to their former team and for that matter any team? But I think that they’re just a remarkable group. Last year was extremely tough. There was a lot of growing pains, and obviously the growing pains paid off now. They’re in a season 3-0 right now, and I think they have the chance to be really really special, as special as (McKeown’s) previous team with Nia Coffey. I think that when you win, you win because you learn how to lose first. And losing has to drive you to another level. And I think that that’s what we’re seeing with Northwestern right now, that their losses from last year are driving them to have a remarkable year.